Call 435-215-1739 to schedule your first appointment. Do you feel like everyone around you is mumbling? If so, you may be experiencing hearing loss. It’s the third-leading chronic illness among Americans, and it can be a difficult thing to go through. That’s why Miracle-Ear® is dedicated to providing hearing services to our valued customers. If it turns out that you’re in need of hearing aids in St. George, UT, our caring hearing care specialists will be happy to help you find the right fit for your individual needs. Exceeding the expectations of our customers is a top priority for our highly skilled hearing care specialists, which is why we’ve committed ourselves to utilizing modern techniques and innovative designs to create and develop high-quality hearing aids. One of our newest hearing solutions is the GENIUS™ Technology. With GENIUS™, you can look forward to experiencing the benefits of improved hearing no matter where you are or what the noise level is. From the moment you contact us, you can be sure that you’ll be treated with courtesy and respect throughout the entire process. We can provide you with free hearing tests* as well as hearing aid repairs and fittings. When you visit Miracle-Ear in St. George, you’ll be delighted to learn what makes us an exceptional resource for all of your hearing needs. Call or visit us today. 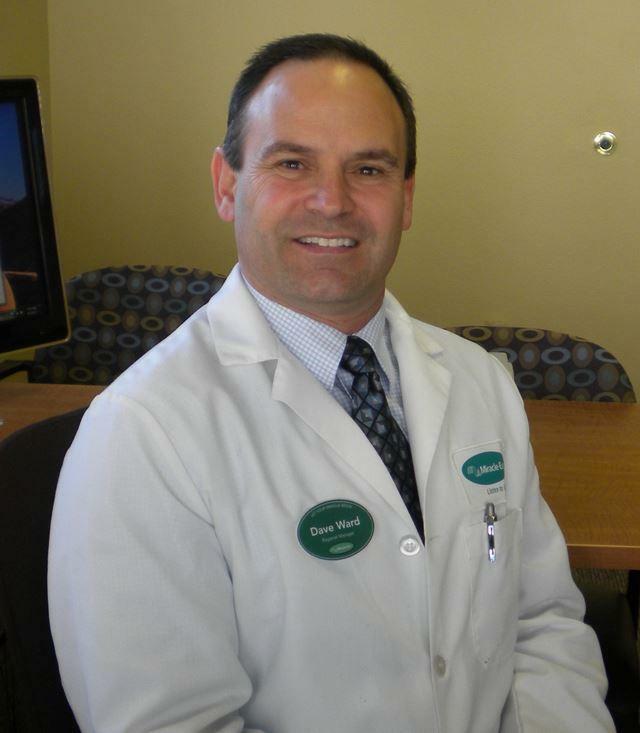 David Ward has worked for Miracle-Ear for 14 years as a Hearing Instrument Specialist, and has 7 years of experience as the St. George, UT and Cedar City, UT Miracle-Ear franchise owner. David earned his Bachelor�s degree in Health Education at the University of Utah. He is Nationally Board Certified as a Hearing Instrument Specialist and is a member of the International Hearing Society. He has been providing evaluations, counseling, and recommendations for Miracle-Ear since 2005 and understands the importance of thorough testing, open communication, and exceptional patient care for every person who walks through the door. David really enjoys being able to help people reconnect with family and friends and improving their quality of life by enabling them to hear and understand more clearly. While the technology we have today is amazing, the follow-up care we offer is crucial to ensure that our patients are receiving not only the service and cleaning they should have, but also what programming best meets their personal and lifestyle needs. Our office has twice won the prestigious national Platinum Club award, and once been awarded the �highest Customer Service Satisfaction� award. My favorite part of working with Miracle-Ear is being able to help patients reconnect with family and friends and improving their quality of life by enabling them to hear and understand more clearly. While the technology we have today is amazing, the follow-up care we offer is crucial to ensure that our patients are receiving not only the service and cleaning they should have, but also what programming best meets their personal and lifestyle needs. I’m writing this letter to let you know that I am thoroughly satisfied with my new Miracle Ear system, and to thank you for changing my life. Severe hearing impairment, as I was routinely experiencing, is more painful, in terms of living with and dealing with other people, than most people can imagine. With my new ears, I can now interact with others in a normal way, even in difficult environments. I am hearing and understanding homilies in Church, and engaging in conversations in restaurants like I have not been able to do for years. And watching and hearing TV via the Bluetooth system, is nothing short of wonderful. I had repeatedly seen your ads for Miracle Ear, and your claim that you could improve my hearing significantly with your Miracle Ear system. I am an engineer by education and trade, so I do believe in the improvements that modern technology can make. Still, I came to you with a lot of skepticism that your system could substantially improve my hearing over the hearing aids I had been using for years. Well, I am so happy to say that my skepticism was unfounded. You really did it! And I can only give you my heartfelt thanks for giving me back an important part of life that I thought I had lost forever.